Save the Sound is thrilled to launch phase two of green infrastructure retrofits at Connecticut’s Beardsley Zoo! In 2015 we partnered with the Beardsley Zoo to bring to life phase one of their Green Infrastructure Long-Range Plan, which identifies opportunities for managing stormwater runoff produced by the zoo’s parking lots. As a part of this effort, we worked with the zoo and other project partners to design and build a rain garden and porous walkway that filter and absorb stormwater runoff from one quarter of an acre of impervious asphalt, and help prevent pollution to the Pequonnock River and Long Island Sound. In addition to reducing stormwater runoff, the project created an opportunity to teach local youth and Save the Sound members about green infrastructure. Beardsley Zoo green infrastructure workshop, May 2016. 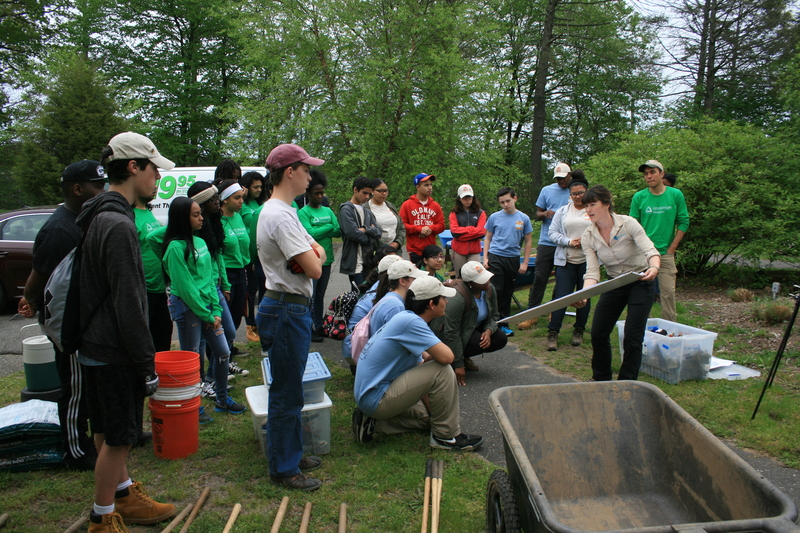 Following construction of the walkway and excavation of the rain garden, we led an educational workshop and hands-on planting for young adults from the Beardsley Zoo Explorers and Conservation Discovery Corps, the Mayor’s Conservation Corps, and Groundwork Bridgeport. Our members participated in a second planting in September 2016 to further enhance the rain garden with hearty perennial plants that birds and butterflies love. 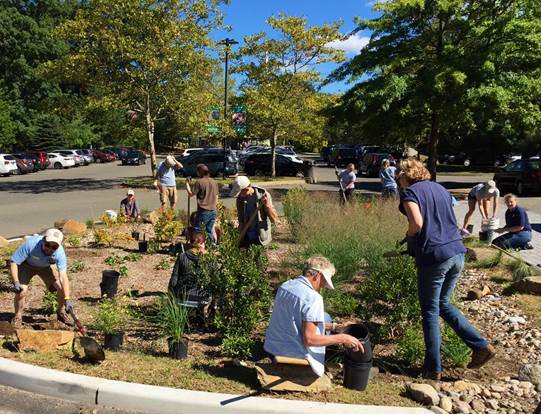 Rain garden planting, September 2016. Photo by Kendall Barbery. For phase two, we’ve set a goal of capturing stormwater runoff from an additional acre of the zoo’s impervious parking lot, and filtering it through porous pavements, rain gardens, and other green infrastructure features. That means more than fifty percent of the zoo’s parking lot will be sustainably managed by the time of the project’s completion. We’ll spend this summer working with the zoo to develop design plans and workshop materials, with plans to break ground in late summer 2017. As a part of the construction of this project, we are also launching a new collaboration with the Connecticut Chapter of the Northeast Organic Farmers Association—who will co-lead a hands-on professional development workshop for landscapers and construction contractors interested in gaining experience in green infrastructure installation techniques. Before long, you’ll head to the zoo to see the peacocks as well as the porous pavement, and learn all about what you can do to prevent pollution and manage rainwater where it falls. Phase two of the Beardsley Zoo project is made possible thanks to grant funding from the National Fish and Wildlife Foundation’s Long Island Sound Futures Fund, which is partially funded through the Environmental Protection Agency (EPA). Phase one of the project was also made possible by EPA funding through a Clean Water Act Section 319 grant, administered by the Connecticut Department of Energy and Environmental Protection. With the future of the EPA yet to be determined, we’re thinking about all the amazing green infrastructure work the agency has made possible – and hoping to continue this work for years to come. To learn more about the Beardsley Zoo green infrastructure project, contact Green Infrastructure Program Manager Kendall Barbery.